Important Note: This guide is currently outdated and pending for an update. With all of the new Twisted Insurrection terrain, even experienced mappers can find it difficult to get used to it and use it properly. I've written up this guide to show you a few tricks and show you how certain tiles are supposed to be used. This should prevent the TI mappers asking the same questions over and over again, some of you could even pick up a few new tricks. Right, lets start off with some of the new tiles and their properties. Some cliff pieces affect certain adjacent cells by making them impassable. This only occurs if said cells contain the basic "clear" tiles and not, for example, sand or rough terrain tiles. 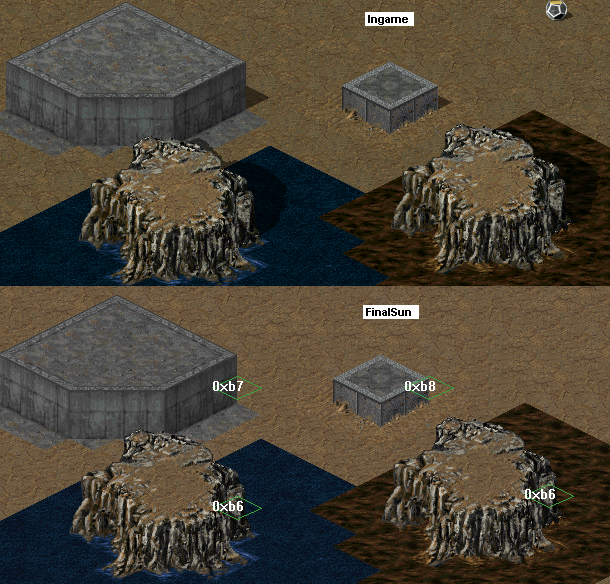 Warning: Placing tiles that are both passable and allow Tiberium (e.g. grass, sand, even certain slopes) on these cells may cause serious pathfinding issues. If Tiberium spawns on these cells, it bizarrely breaks pathfinding for all units. This actually happens in TS as well, which is why the official maps had left these cells clear. It's strongly recommended you do the same, at least near Tiberium spawn zones. All 4 types (green,blue,red,purple) of Tiberium can be used already. In FinalTI on the left menu under "Special/Overlay - All Overlay" you can find all 4 tiberium types. All crystals spawn tiberium. Purple and white spawn cruentus. The white crystal should be placed only as decoration on terrain that doesn't allows tiberium to spread there. These nifty little add-ons make Tiberium look much more realistic as they spawn tiberium patches over a wide area. They act exactly the same as invisible light posts but also spread Tiberium, be sure to only use them on Tiberium patches and not on areas that just require lighting. More information here and here. You can also use them between green Moss and blue Mold areas where you want a constant but very small tiberium growth, so it looks like Moss and Mold contaminate the area with tiberium. Warning: Do not place the Cruentus spreader near slopes as this causes an Internal Error when it tries to spawn a patch on a slope. Note: All 4 Spreader should be placed at least 6 cells away from water, as they use debris to spawn the small patches of tiberium over a wide area and the debris would cause an irritating random splash when landing in water. Here is a GIF showing via splashes the general range of the spreader. The spreader should be placed on the same cell as the Tiberium tree or crystal so the latter lies at the center of the distribution area. The animation shows the spread area a bit north-heavy from the center, but this has since been rectified. The first four tiles in this set are supposed to be placed underneath Tiberium tree's to give off a sprouting from the ground effect. The rest of the tiles in the set are just eye-candy and can be used where-ever. The Tiberium trees are to put put right in the middle of these tiles in order to look right. As new terrain can't just be given shadows attached to them (which is really gay), Lin Kuei Ominae made a little workaround overlay which gives the illusion of the cliffs casting a shadow. Another advantage to this is that in Vanilla Tiberian Sun, the water cliff corners were also missing shadows. Three overlays have been made, one for the missing water cliff corner shadow, one for the High concrete cliffs and another one for the low concrete cliffs. To locate these overlay tiles in the map editor, go to Special / Overlay in the sidemenu and then go to All overlay, near the bottom of the list, there are three overlays: CSHADFXA, CSHADFXB and CSHADFXC. CSHADFXA is the tile that is to be used on the missing water cliff corners, this applies to both the thorn water cliffs and the normal water cliffs. ALSO Don't forget that thorn and normal water waterfalls require this overlay too as they also miss the corner shadow. CSHADFXB is the tile that is to be used on the high concrete cliffs corner. CSHADFXC is the tile that is to be used on the low concrete cliffs corner. Due-to certain limitations, you can't use auto-lat concrete on the TI concrete additions (unfortunately). There is a terrain set in the LAT list called 'Pavement Fix A (No Auto-LAT)', this set is used on any TI new concrete additions such as the low cliffs, paved road fixes, city pavement etc. This will take longer to do, but it's definitely worth the results. I'm hoping that you're all aware of this by now so I don't have to do any more explaining. If you have any questions regarding this however, feel free to ask. There is a few more things similar to this in the TI terrain list. 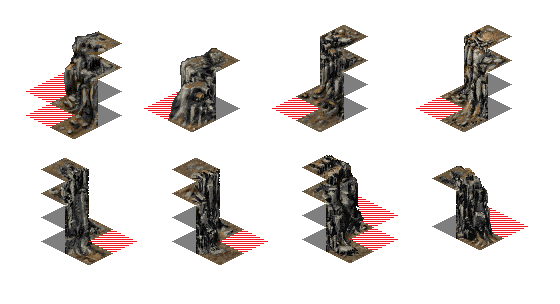 As you can't use auto-lats to auto-attach to new terrain, quite a few fix sets had to be made, including fix sets for the Crystal LAT tile and the Blue Mold Tile. Those tiles are to be used the same way on any new Mold / Crystal tiles (like the blue mold cliffs for example). There is also a tile set called 'Clean Grass Fix' which I put together specifically for urban areas, this is so you can create squares of grass in cities without worrying about it auto-smoothing when you get in-game. Again, the majority of you should already know this, but if you have any questions, feel free to ask. Don't forget: When you're placing down new LAT's be sure to know their passability settings, It's annoying when you're making a map and you can't figure out why your units wont go past a piece of terrain. Common sense really, you should all know the terrain passability settings by now. Anyway, those are the essentials, now here are a few tricks for extra detail and variety. Some of you may have tried doing this with the Vanilla TS terrain in order to create some new terrain styles. Obviously in TI, you don't need to copy and paste Paved roads and what-not together to make new terrain as we already have plenty of additional terrain that TS really should of included. Anyway, if you have tried this before, you should try it with some of the TI terrain, mix some things together, you could come up with some excellent results (I recommend experimenting with the Rough Ground and Clear LAT additions sets). This trick is pretty much similar to the above, but not actually using the CnP function. If you've made a large map and don't like repeating the same terrain tile very often, why not go over some with other terrain to create something that looks new? A good example of this would be on the Ditches and Jaggeds set. As repetitive terrain isn't that good and there isn't exactly a huge amount of ditches and jaggeds (and other bits) I like going over particular terrain to either remove bits of it I don't like or just to create the illusion of a separate terrain tile. Like this for example. This trick doesn't apply to just ditches and jagged tiles, try using it on Rough ground, Cracked dirt (large tiles) etc. and see what you come up with. This doesn't work well on every tile however, make sure while trying this you avoid making any blocky terrain. The map size is basically up to you, however you should take care that at least 4 to 5 cells are left outside the playable area which is set via the blue border in FinalSun. This isn't only useful for trains which you might want to move outside the playable area for a short distance, but also to prevent aircraft getting stuck at the map border. Some aircraft in TI have a quite big turning circle and when they hit the red border, they get stuck there until the player manually orders them back into the map (which he might not be able if he forgot to assign them to a group and hasn't selected them anymore). Thus the best is, if you even leave up to 10 cells space. Can I place tiberium on grass? I'd rather you didn't otherwise a certain somebody will create mass-murder. Are you sure you didn't accidently place the Cruentus spreader instead of a purple light post? If Cruentus is spread on a slope, the game crashes. Just out of interest, in what way did you create those Tiberium Spreaders? The links to additional info that are provided no longer work. I'm curious if it would be possible to modify the Riparius itself to exhibit a similar effect, but with a radius only two cells greater than the tree, in order to correct the regrowth problem in vanilla TS. Invisible lightpost that uses animations to spawn afaik. Ask LKO, he created the logic. No, riparius can't be changed, or better said, it shouldn't be changed. Because the debris system used even on only a few of the tiberium patches would cause noticeable lag. Imagine how many single tiberium patches are on a regular map. Even if only every 10th patch would spawn the debris, you force the game to constantly show surely 100 up to 1000 animations. And each of these would create new tiberium which can again show the anims. Ahh fair enough, I guess I'll just trust that you all have probably considered/tried every feasible solution by now. I found myself replaying the campaign for TS after 15 years (I had forgotten how good it was) and re-discovered the tiberium quirks. Kind of bizarre such an integral and basic element of the game could have such strange behavior after Westwood's previous games worked so well. Updated the original post with some (hopefully) helpful images and important information for future reference. It's also the first time i see a plausible explanation for the cliff path finding issue. I assumed and noticed ingame something like this, but couldn't put it into words. The gifs are also done very well. Thanks. I don't know why it happens, but I noticed the problem on my own maps when testing them and took a look at Westwood's maps, where these cells were almost always left "untouched". I replaced any problematic cells with clear terrain and the problem was gone. I wonder if it has anything to do with the CliffBackImpassability key in the [General] section. Thanks a lot for doing this, definitely a great addition.